ok, so after 6 builds, and 170 pages, I have a final build. this is where I am at so far, I am currently using 12 TEC's for a total of 1740watts of TEC cooling. 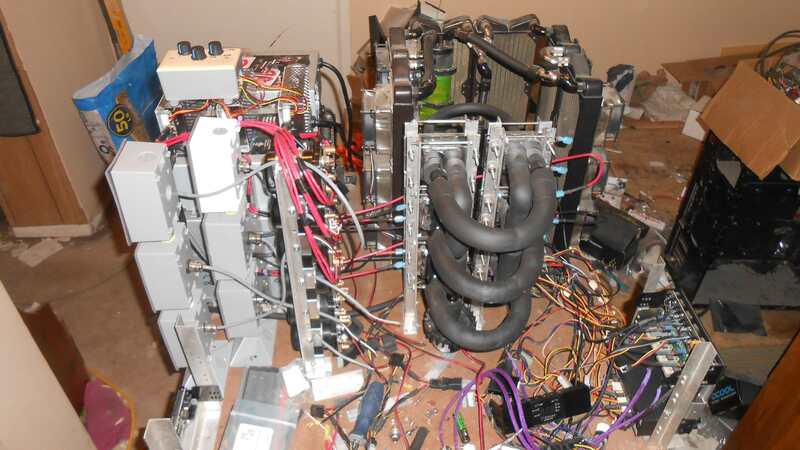 all the TEC's will be water cooled, with a total of 24 CPU water blocks being used. I now have 12 radiators for this build, 6 radiators on the 331watt TEC's, and 6 radiators on the 224watt TEC's. ok I am going to try and detail a complete parts list. 1 X koolance 12volt to 24volt pump motor step up. Last edited by toolmaker03; 03-30-2019 at 11:34 AM. The only things I recognize in that picture are the Aquaero and the rads! Is there a PC in there or is this just the cooling system? Monsoon Free Center Hardline Compression Fittings, 1/2" x 5/8"
I can't believe it, we're actually looking at an operational product! This is definitely a long time coming. Are you still planning on putting everything in the coolers like you were planning to do at one point? What about the modeling clay? The beast. If I hadn't been following along all this time, I'd have trouble deciphering that picture. the last thread was getting to long, so I decided to create a new thread to cover the end of this last build. you may have noticed that I am going a lot slower on the build this time, the reason for this is that I am testing everything before I finalize it on the build. this process takes longer, but I think that the end result will be a hassle free build upon completion. I am done building this rig, I have made a stopping point, and I am sticking to that. 12 TEC's are enough to give me 3 times the load of the system in TEC cooling, and that is really all I need. as the years pass, I may upgrade this system, but I will not add more TEC's to it. if the last build, with 9 TEC's, had provided me with just a little better drop from ambient than 8C with the system at load, I would have stopped there. I know that I have not been showing all of the testing I have been doing, but is hard to test, and take pics at the same time. as well I am a red neck when it comes to building my test rigs. so they are dangerous, and I would not want others to try doing, what I am doing with my test builds, as destroying stuff is highly possible, with the way I throw it together. Last edited by toolmaker03; 01-30-2018 at 02:56 AM. ok, so for a update on the TEC's I sent back to be fixed. CTE decided to simply replace, rather than fix, the TEC's I returned to them, I can not complain about that kind of service. I am not a big costumer by any means but for me I have already spent about $1200 on there TEC's, and for them to treat me this well gives me good reason to continue getting there products and get even better ones next time. so as these TEC's begin to fail I will replace with metallized, ruggedized, versions, of course those will be $200 TEC's each but I feel like they will make for nice upgrades to the ones I have now. You went with metalized surfaces on the new ones? Better heat transfer?